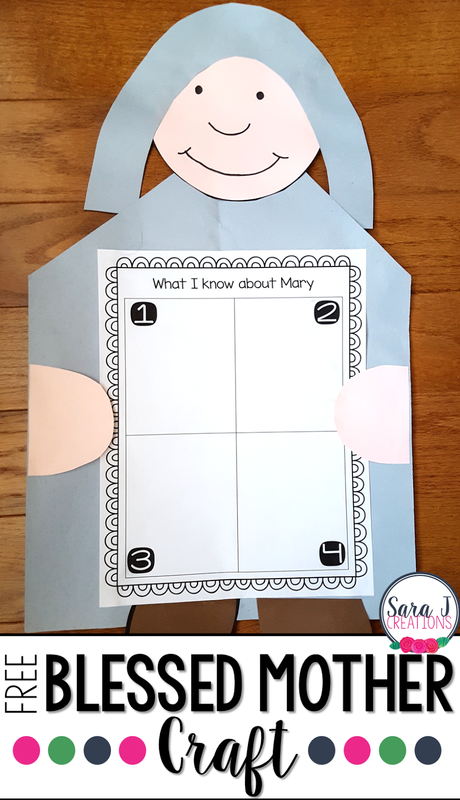 Last year, I was searching for a Blessed Mother Mary craft that my students could do during catechism class. I couldn't find anything that was simple enough for the time we had together so I created my own craft and decided to make it a freebie for my readers. This can be used any time of year but works particularly well for the Feast of the Immaculate Conception (December 8), Mary's feast day (January 1), the Christmas season, the date we celebrate her birth (September 8) or the date we celebrate her death (August 15). It is a basic craft that can be used for students to show what they know about our Mother, or as a craft that holds the prayer, Hail Mary. Decide first if you want the Mary craft to hold the Hail Mary prayer or the 4 things I know about Mary sheet. Have students fill this out first, as it isn't too easy to write on paper after it has been glued down. I decided to take my craft templates and make tracers on chipboard (I used Silhouette brand) so that I could reuse them each year. If you've never used chipboard, it is like cardstock but sturdier and thinner than cardboard. I wrote what the piece was for and how many of it each student would need. Alternately, you could copy the templates right onto colored paper and skip the tracing step altogether. You could also print it on white paper and have students color it and cut it out. I would use cardstock or construction paper to make the craft a little more sturdy. 1. Cut the top corners off of the large piece of blue construction paper. 2. Glue the head to the top of the construction paper. 3. Glue the head scarf on top of the head. 5. Glue the shoes on the bottom. 6. Glue the 4 facts page or the Hail Mary prayer in the middle of the large blue paper. 7. Glue the hands on the sides of the blue paper so that it looks like she is holding the facts page. My kiddos did such a great job with these. It was quick and easy but a good chance for them to reflect on what we've learned about Mary so far this year. Want to grab your free template? Just click the "click to download" button below, enter your information and they will be emailed directly to you.